Do you believe in the power of positivity? If so, roll up to Wall Street… because it’s abundant. According to the Wells Fargo/Gallup Investor and Retirement Optimism index, investor optimism is at its second-highest level. The survey of 1,015 Americans with $10,000 to spend outside of their retirement funds recently hit 140 points – just shy of the record 147 in September 2000. Hardly surprising, given the rampant stock market – the Dow, Nasdaq, and S&P 500 are up 24%, 27%, and 19% year-to-date. For some investors, the mention of “small-cap stocks” triggers fear in itself. They assume the stocks are riskier. These small-cap companies (with market caps between $300 million and $2 billion) are often the lifeblood of American innovation and entrepreneurship. They also lead the biggest rallies from downturns and recessions, as investors feel the same optimism that prevails at the moment. Yet small caps have underperformed this year – the Russell 2000 is up just 11.7%. So why are they lagging? Indeed, the largest 30 stocks have accounted for half of the index’s gains. Quoted in CBS MoneyWatch, Francis Gannon, co-Chief Investment Officer at Royce & Associates, says the “global economic recovery should benefit some of the more economically sensitive or cyclical areas of the market” – like small caps. 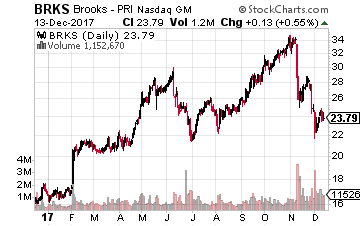 Brooks Automation Inc. (Nasdaq: BRKS): Selling its products in 50 countries, Brooks is one of the firms leading us into a more automated world as technology improves. The company provides automated solutions for the semiconductor manufacturing and life sciences industries. Its semiconductor business includes chip equipment automation, monitoring, cleaning systems, robots, vacuum pumping and cooling in industries like display manufacturing and LED production. The life sciences business focuses on biological sample management for human specimens (cells, blood, tissues, etc) – collection, processing, cold-storage protection systems, safe retrieval and transportation, and disposal – as well as samples for drugs and consumer products. In fiscal 2017, Brooks notched a 23.6% sales increase to $692.9 million, with net profits jumping 190% to $62.6 million. The most recent quarter saw a continuation of this trend, with sales and profits rising by 15% and 65%, respectively. Both the net and operating margins sit around 10%, allowing Brooks to pay a $0.40 per share annual dividend (1.6% yield), with a comfortable 45% payout ratio. And unlike many smaller companies, Brooks is actually less volatile than the overall market, as indicated by its beta under 1.0. 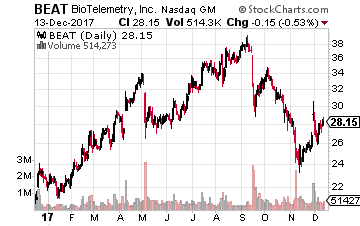 BioTelemetry Inc (BEAT): Name one area that’s never going to go out of business. If healthcare isn’t at the top of your list, it should be. BioTelemetry is a small cap wireless medical technology and research company, focusing on cardiology. And it’s at the cutting-edge of more accurate and effective patient care. That care begins with the company manufacturing wireless, non-invasive cardiac monitors. It then works with hospitals and clinics to analyze and diagnose heart disorders in a faster, more efficient way, as its devices can monitor patients remotely. For example, its Mobile Cardiac Telemetry, Event Monitoring, and Holter Monitoring products use sensors to capture ECG data and heart rhythm beat-by-beat, detect irregularities, and wirelessly transmit the data to providers. Biotelemetry also provides research and data management services to healthcare companies. This includes cardiac monitoring, image scanning, consulting, device trials, and drug treatment. Services here also branch out to cardiovascular, oncology, and neurological therapy areas. Healthcare is an expensive business, but BioTelemetry is working hard to provide more efficient care, while controlling costs. And needless to say, its mission is proving popular and having an impact on the bottom line. With 16% revenue growth in the last fiscal year, net income growth shot up by 619%, to $53.4 million. Margins sit comfortably in double-digit territory, which exceeds its rivals. And like Brooks, BioTelemetry also has a beta under 1.0. The company is expanding, too. In early December, it announced a partnership with Apple to provide cardiac monitoring for the new Apple Heart Study app. Working with Apple Watch, it will detect for irregular heart rhythms and atrial fibrillation. This follows the completion of the $280 million buyout of Switzerland’s LifeWatch AG in July – a deal that boosts BioTelemetry’s leading presence in remote cardiac monitoring, given LifeWatch’s similar work in digital health systems and wireless, remote diagnostics. While small caps in general may have lagged the broader indexes, these two crucial companies are bucking the trend. And they’re well positioned for further success in 2018. The fact that they’re less volatile than the overall market sweetens the deal for risk-averse investors, too. A historic event the World Economic Forum predicts will create more wealth in the next 7 years than in the entire history of civilization combined. But only small group of fast acting investors will accelerate their wealth by 3,000%. 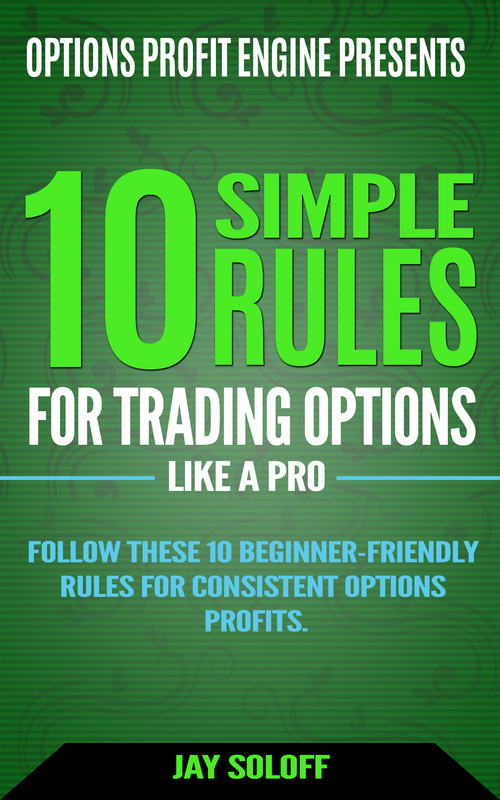 Click here to discover how to find the $100 trillion in industry profits. Author: Martin DenholmMartin's career in the financial publishing industry spans almost two decades. Over that time, he’s worked as a managing editor, investment analyst, and senior correspondent for a host of stock and options newsletters, e-letters, and websites. He's covered a wide range of sectors, industries, and companies, giving insights on profitable trends and making successful recommendations to investors on companies like JetBlue Airways, Abercrombie & Fitch, Faro Technologies, and USA Technologies. Martin is originally from Southampton, England and is an honors graduate of Brunel University in London.